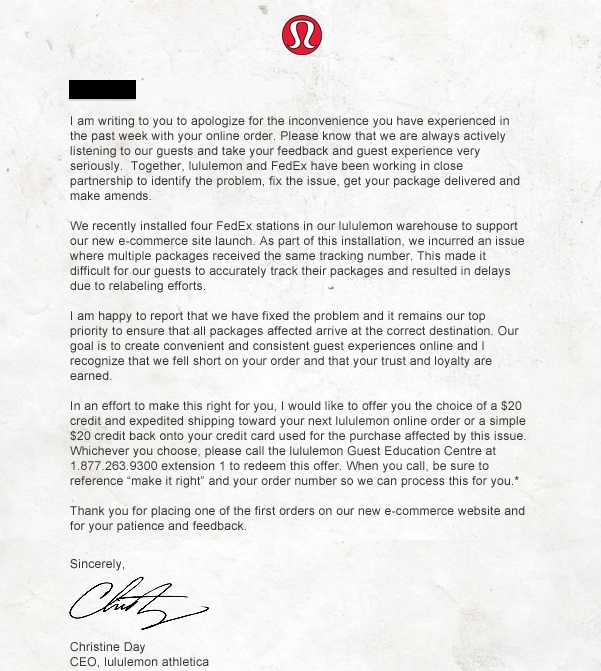 If you were one of the customers affected by the shipping Issues on April 15th on the launch date of the new Lululemon E-Commerce site you will have gotten one of these letters from Lululemon. I’m really happy to see them working hard to keep the affected customers happy in light of this unfortunate and untimely hiccup. It’s always a bummer to have to report stories like this one but it does make it all the better to have them acknowledge the issue and to let you know they value your feedback and business. So tell me, do you plan on using your credit towards the next ‘Upload Thursday’? "Half Marathon Race Day Outfit"
Ughh its not actually a $20 credit towards your next ONLINE order. You have to order it over the phone at the time you call. Such BS. How hard would it be to credit people's online accounts? You just need to place your online order with the GEC and you get the credit and free shipping upgrade. Or you can get $20 back on credit card. Pretty sweet, I would say! @Lulumum I thought about that too… but Considering it takes me a full week to get packages [east coast].. the upgraded shipping was a huge perk. You have the option of calling GEC later when you are ready to order from online.. just thought it would have been nice to do it all online. personally I would opt to have it back on my card, that way I can just use it for online purchases.